Takeaway: Part of growing up is realizing the role of romantic love. 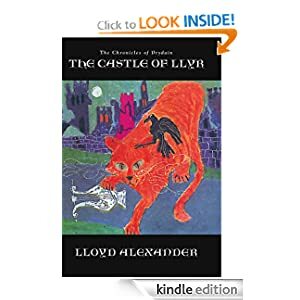 The Castle of Llyr is the most romantically focused of the Pyrdain Chronicles. Taran is charged with accompanying Princess Eilonwy to her relatives so that she might learn how to be a princess (and not a scullery maid as she has been doing at Caer Dalben). As Eilonwy prepares to leave Taran realizes that he does not want her to go. Once again there is another foil of about Taran’s age that helps Taran understand how to grow up in a different way. Prince Rhun is very nice, very honorable, but incapable of doing anything correctly. He bumbles everything. And Taran learns that Rhun’s father wants to marry him to Eilonwy. Meanwhile, Eilonwy is kidnapped and instead of being able to search for her, Taran is told to protect Rhun, who of course gets lost. As you might expect, Taran learns that Rhun is good in his own way, and Rhun grows a lot on his own. Still in the end, both Taran and Rhun want to be the one to save Eilonwy. While this is the most romantic of the series, it is mostly another quest book. This time the quest is Eilonwy. This is also would make a good read aloud for 8-12 year old boys (and many girls as well). The audiobook is the same narrator that I have not really cared for in the previous two books, so again I suggest that you read this in kindle or paper (both the same price) and skip the audiobook.